With the Miami Dolphins ushering in a new era of football in 2019, hiring former New England Patriots defensive coach Brian Flores as their head coach may only be the first major domino to fall. Despite finishing with a 7-9 record this past season, the Dolphins graded out as the worst passing team in the league, leading many to speculate that Ryan Tannehill’s time in Miami may be cut short. According to Over the Cap, cutting Tannehill would not only save the team roughly $13 million in cap space in 2019, but it would also help justify taking a quarterback in the first round on the NFL draft this April. In our most recent post-Super Bowl 2019 NFL Mock Draft, PFF’s Senior Analyst Mike Renner predicts the Dolphins will use their 13th overall pick on Duke quarterback, Daniel Jones. Let’s take a look at why moving on from Tannehill and drafting Jones could be the right move. 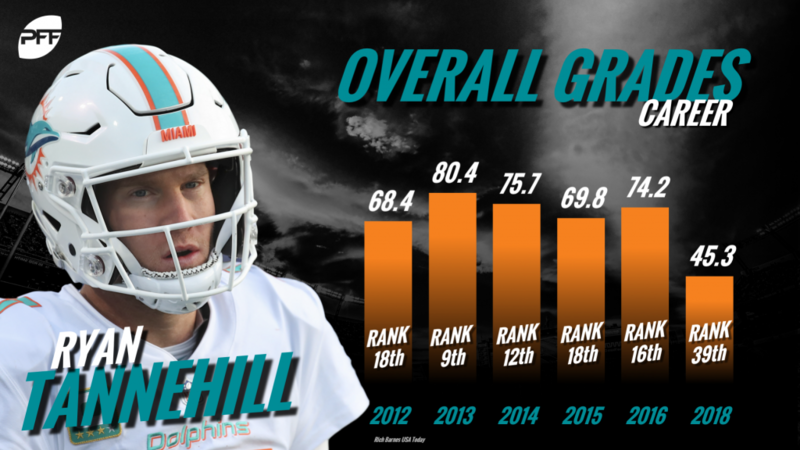 Although he’s graded decently over the course of his career, Tannehill struggled in 2018 posting a 42.4 passing grade over 11 games. Not only was this grade a career-low, but it also ranked last among qualifying quarterbacks in NFL. Unfortunately for the Dolphins, there weren’t many areas where Tannehill excelled this past season. Even when given a clean pocket to throw from, Tannehill ranked 20th in passer rating and 26th in completion percentage. Tannehill’s biggest weakness this season was his inability to push the ball downfield with any type of consistency. Despite 12.8% of his total attempts being 20 yards or more downfield, Tannehill finished last among qualifying quarterbacks in deep ball accuracy leading to a 70.8 passer rating on such throws. Yes, it was a lackluster year for Tannehill, but the blame can’t all be put on him as the Dolphins offensive line was one of the league’s worst, finishing in the bottom six of pass-blocking efficiency as a unit. In fact, Tannehill was actually quite efficient registering a 109.4 passer rating when getting throws out in less than 2.5 seconds. Despite ranking 31st in passing attempts under 2.5 seconds, Tannehill’s offensive line did him no favors, allowing him to be sacked 11 times on such throws, the fourth-most in the league. Enter incoming rookie quarterback and projected first-round pick, Daniel Jones. A three-year-starter at Duke, Jones has the size of an NFL QB (6’5”, 220 lbs) and made huge strides in his final season finishing with a career-high 80.3 passing grade. Jones’ ability to get the ball out quickly should translate well to the NFL, especially on a team like the Dolphins that struggles in pass-protection. One of his most impressive stats this past season was his average time to throw coming in at a lightning quick 2.21 seconds. On all attempts under 2.5 seconds, Jones threw for 17 touchdowns and only four interceptions finishing with an NFL passer rating of 99.8. Jones also impressed by finishing with an adjusted completion percentage of 74.3%, up from the 68.9% he posted in 2017. Like Tannehill, Jones also struggled on the deep ball finishing with just a 69.0 passer rating on 45 deep attempts. While this is a clear area for improvement, Jones had little help from his Duke pass catchers as no other quarterback in the NCAA had more attempts dropped (nine) on deep targets. Tannehill may have some years still left in the tank but based on his recent play, looking at Jones or any other quarterback in the draft will be wise for the Dolphins. Barring a trade, Jones could be the best option as the Dolphins aren’t likely to get a shot at the top quarterback prospects sitting in the middle of the first round. With offseason decisions looming and a team looking for their first playoff win since the 2000 season, a fresh start at the QB position could be exactly what this franchise needs.